SUZUKA, Japan (AP) — Lewis Hamilton dominated practice for the Japanese Grand Prix on Friday, an early indication that the Formula One championship leader will be tough to beat in Sunday’s race. After leading the morning practice, Hamilton clocked a time of 1 minute, 28.217 seconds in Friday’s second practice session, finishing 0.461 seconds ahead of Mercedes teammate Valtteri Bottas. Ferrari driver Sebastian Vettel was third fastest. 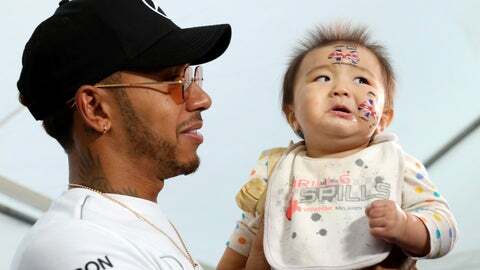 With five races to go, Hamilton would move a step closer to winning a fifth world championship with a win in Suzuka, a race he has dominated in recent years. Hamilton has won five of the last Formula One races and three of the last four at the Japanese Grand Prix. After winning the Russian GP last week, Hamilton leads Vettel by 50 points. Even if Vettel wins all five remaining races, he’s not guaranteed to beat Hamilton. Red Bull’s Max Verstappen was fourth followed by Vettel’s Ferrari teammate Kimi Raikkonen in fifth. Verstappen’s teammate Daniel Ricciardo was slowest of the drivers from the top three teams, just 0.015 seconds behind Raikkonen. Force India’s Esteban Ocon was the quickest car outside the usual top three teams, finishing seventh ahead of Haas’s Romain Grosjean. Sauber’s Marcus Ericsson finished ninth, with Toro Rosso’s Brendon Hartley rounding out the top 10. Qualifying for Sunday’s race will be held on Saturday.